Words can hardly convey the pure condensed Americanness of this manic picaresque, although "Ben Franklin meets Huck Finn" might begin to do the trick. Join the memoirist as he impersonates the clergy, breaks out of several jails, assumes false identities, and becomes the occasion for an outpouring of popular myth. 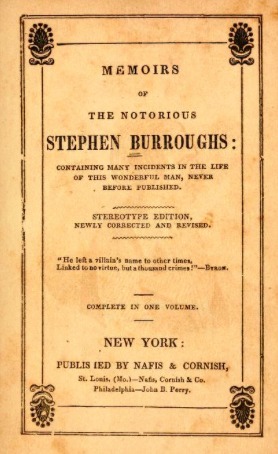 (By the end of the narrative, Burroughs has not only become a kind of trickster figure anchoring countless tall tales; aspiring young criminals have actually started posing as him.) The appendix informs us that he ended up teaching school and quite possibly counterfeiting money in Canada. An epic by an outlaw.